While in Ceuta, a Spanish enclave on the north shore of Morocco south of Gibraltar, we decided to rent a car and head down across the border to explore Morocco. So early on the morning of the 22nd of July we picked up a rental car from an outfit in Ceuta and drove towards the border. The first thing we noticed at the border is the human traffic on foot going and coming across the border, as Moroccans living in Ceuta head towards the cheaper shopping found on the Moroccan side not far from the boarder a 20 minute taxi ride down to city of Tenouan. We paid 1 Euro highway toll and also headed that way via a super highway. We passed by mile long beaches that where still hardly used as the tourist development is mostly on the Atlantic coast but growing a rapid clip on the Mediterranean cost as well. We were very disappointed with Tanouan as there is really nothing to see but for shopping, we are not much for shopping we wanted to see the countryside and the old towns described on the travel brochures that we found in Ceuta, meet the locals and learn about their culture. We got back in the car and high tailed it south via the country roads towards Fes. On the way we stopped for breakfast at a roadside restaurant. We had local bread a bowl of olives, soft cheese and coffee for both, all for an unbelievable 1.80 Euros for both of us, which was a wonderful surprise. On the way down south while driving through the Rif Mountains we saw a road sign with the name of a town called Chefchouan, we could see this town up in the mountains. We read something about it in the brochures mostly Spanish, which we both cannot read that well. Anyway we decided to explore so we made a left turn and headed up the hill, we passed a newer town by the same name and then we could see the old town further up and more human traffic near open markets and up a little further we could see the old town, so we parked the car and walked up to the old town of Chefchouan, what a nice surprise with its very narrow streets all painted light blue, full of vendors selling anything imaginable, dates, almonds, olives, nuts, souvenirs, meat, live chickens etc.. The atmosphere was incredible. We booked into a small hotel within the village and spent a couple of days there. From Chefchouan we headed south towards Midelt. We stopped for a short while in the historical city of Fez with its fantastic medina, the city surrounded by a wall and all the mosaic around many places and we visited the Royal Tea house where the King visits now and then. After we left Fez we drove for a while and we came upon a road that seemed not well kept, with many potholes and wide enough just for one car, the side of the road was all jagged rocks that would tear the small tires on the little car that we were driving and some places the edge of the road would drop about 30 cm. This road was very straight for long stretches, I was hoping that no cars would come the opposite way, but sure enough I could see something heading our way over the horizon as it got closer I realized it was a bus, the question was who is going to chicken out and move to the side off the road, so I decided the best thing to do was to for me to stop the car very close to the edge of the rode and wait to see what the bus driver will do and sure enough without any fuss the driver slowed down put the right wheels down the side of the road, pleasantly waved for me to move and that was it, this was repeated a few more times more as we encountered more traffic heading the opposite way. I thought this road was never going to end, it was very hot and every time we see an incline we would hope that the end is near but as soon as we get up the incline we could see the road heading towards the horizon. When we finally came to an intersection we realized we were on the wrong road, must have missed a road sign while watching the scenery go by. Well we got to Midelt late evening, booked into a hotel, went for a tajine dinner that cost Euro10.00 for both including drinks. We had a good sleep and the next day headed towards the Sahara, arrived in Rissani where we met the agent that would take us to the Kasbah in the Sahara Desert. 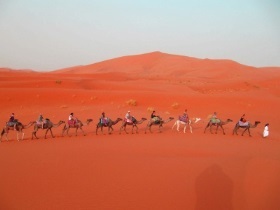 From Tissani we drove with the guide to Merzouga at the edge of the Sahara Desert. Mubarak one of the hotel owners showed us around the Kasbah and took us to our room, which was a very nice well appointed. We had lunch went for a nap and then at 7:00pm we got on the camels and headed for a night in the desert dunes, some of the dunes are over 200 meters high and all red sand it is just amazing, we had another seven people in our camel caravan plus the guide that just walked all the way, and the camels just followed, well trained these camels. 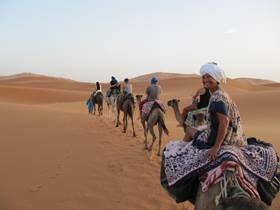 I never rode a camel before but I can tell that riding a camel is most uncomfortable, plus you have to really hold on especially going down the steep dunes, I felt that I would go head over heels every time we descended the dunes. After about an hour and half we arrive at a camp with Berber tents, large thick carpets were laid down in front of all the tents, inside the tents it must have been 50° C so we all decided to sleep under the stars. Later we had dinner two big dishes for everyone and drink, after dinner, which was around 10:00pm we gathered around, and the hosts played Berber music for us, it was perfect. We went to sleep and had a very good sleep and we got up just in time to see the sunrise over the dunes it was incredible. 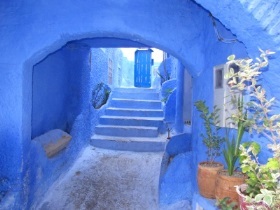 Packed it all up and headed towards the Kasbah for breakfast. After breakfast we packed our things and started our trek west and north towards the Atlas Mountains then to Marrakesh and the capital Rabat. We passed through Toudra Gorge the amazing Azous Falls. All along our trip we saw many locals riding donkeys either with or without a cart, this mode of transportation is more prevalent in the rural areas of Morocco, but we also seen them in Fez delivering propane cylinders and in Chefchouan. 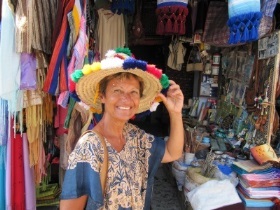 All in all Morocco is just an amazing place to visit, we have been to many other places but Morocco is the only place we would like to visit again, it is just incredible, it is a country where the automobile mingles with the donkey that has been here for over a thousand years.